Garrett College president, Dr. Richard Midcap, announced gift of $2 million from the late Daniel E. Offutt III, an Oakland, Maryland native who was an artist, metal sculptor, and philanthropist. The gift is dedicated entirely to science, technology, engineering and math (STEM) initiatives. 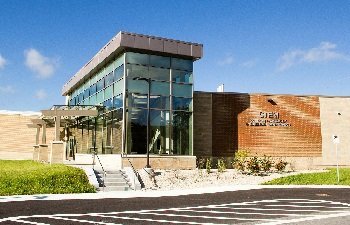 Income generated from the endowed gift will be split between STEM scholarships and technology renewal for the college’s recently opened STEM Building. In honor of Mr. Offutt’s generous donation, the recently opened STEM facility will be named the Daniel E. Offutt III STEM Center in a spring 2019 ceremony. The $5.6 million grant will support tuition-free jobs training programs in IT and cybersecurity. Frederick Community College and Prince George’s Community College will partner with Montgomery College to offer intensive short-term training (boot camps) aimed at providing a pipeline of skilled IT and cybersecurity workers for local companies. The demand for workers in cybersecurity is critical, with almost 20,000 jobs in Maryland going unfilled for lack of qualified workers. 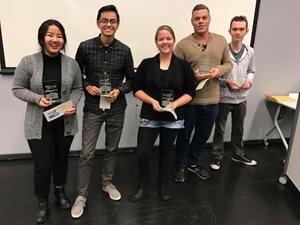 Frederick Community College (FCC) graphic design students took home the top prize at the annual “MockUp: Student Design Challenge” for the second year in a row. The competition was sponsored by AIGA Blue Ridge, a professional design association. Students worked collaboratively to create design solutions for a non-profit client, The Frederick County Humane Society. 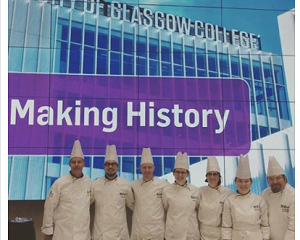 AACC’s HCAT culinary students & faculty invited to join Scotland’s City of Glasgow College culinary students for an international cook-off. Challenged to prepare a three-course meal from a basket of mystery ingredients, the competition pit the best young chefs from each side of the Atlantic against one another. The cook-off cast a spotlight on the partnership City of Glasgow College has recently established with Anne Arundel Community College, and the launch of a formal international student exchange program. Chesapeake College received the Green Genome 2016 award, one of only nine colleges in the country recognized with the prestigious honor. The award carries a $10,000 prize for Chesapeake, which will be used for new sustainability initiatives at the college. Chesapeake has been leading sustainability efforts on the Eastern Shore. Chesapeake has programs addressing: renewable energy generation and storage, sustainable agriculture, watershed restoration, landscape architecture, electric car charging, and energy efficiency. 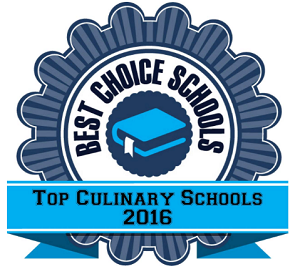 The Hotel, Culinary Arts and Tourism Institute (HCAT) at Anne Arundel Community College was named one of the 50 Best Culinary Schools in the U.S. by Best Choice Schools. At number 14 on the 2016 list, HCAT met and exceeded high standards and performance metrics on the nationwide list. Criteria for selection included that the school provide hands-on experience, internships/externships, student-operated restaurants, modern facilities and a solid reputation in the industry. D.C.-based magazine, Washington Monthly, recently ranked four- and two-year colleges by their service to adult students. Howard Community College came in at number four on the list, with high scores for ease of transfer, flexibility of programs, and services to students. With a majority of students enrolled part time, Howard Community College offers a variety of course delivery options to students—online, hybrid, and in-person, as well as daytime, evening, and weekend.